A simple plug n play coupler wall plate with 2 x RCA (Left / Right) Connections. No soldering required, plug your RCA cables and leads into the front and rear of the faceplate outlet. 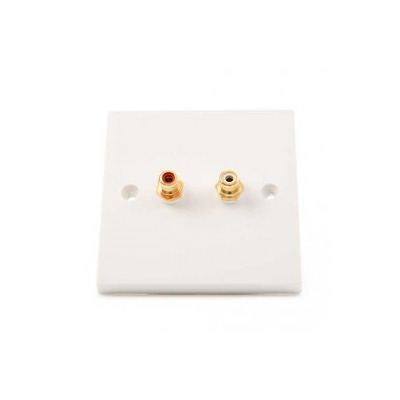 This 2 x RCA left and right stereo audio wall plate outlet is a simple plug n play coupler installation wall plate which is ideal for your left and right sound connections . The Red and White faceplate outlet has two female sockets on the front of the wall outlet and two coupler connections on the rear. Simply plug your male RCA cable or lead into the front and rear of the wall plate to connect your audio visual devices, no soldering required! Our 2 x RCA coupler faceplate is ideal for installing in home, office or business locations where you are looking to connect your audio device such as a LCD, TV or plasma screen to another device such as Blu-Ray, DVD, Xbox, Wii or Playstation gaming console or satellite receiver. Euronetwork manufacture and assemble all our wall plates on site in the UK, so if you cannot find the combination you require please email us at sales@euronetwork.co.uk with your requirements or contact a member of our sales team on 01908371909.